Master Keenan Williams (left) and Maestro Chris Suboreau (right) comparing notes prior to the start of the featured instructional segments for the day. The first Genesis Martial Arts International Hall of Fame event was the high point of my own martial arts career. In my 47 years of martial arts learning and teaching, I have never seen an event so well organized, productive, and uplifting. This event was completely free of politics and negativity. The student's understanding and improvement was foremost in each instructor's mind. During my own class, for example, several Grandmasters volunteered to assist struggling students without expecting any recognition or payment. The normal interaction was along these lines: an introduction to Grandmaster So-and-So, followed immediately by, “Let me introduce my wife, my family, and my students.” Next up, an exchange of hugs, autographs, photos, and deeply personal insights into the martial arts. The first morning after arrival, I awoke to an actual deep – but pleasant – muscle soreness from constantly smiling, hugging, shaking hands, and laughing. The incredible camaraderie and brotherhood lent this event a profoundly comforting aura. It felt like a combination family reunion and holiday celebration. Inside of an hour, I felt like I was among family. The student body was, to me, the most impressive part of the event. The level of concentration and effort put forth by these people was beyond compare. The students would come together to assist each other, without any prompting from the instructors. When this wasn't sufficient, someone within the group would pose a question, in order to receive clarification on a particular technique or sequence, and, the answer was eagerly listened to with open minds. I rarely had to repeat myself. One very talented young man was an exceptionally quick learner. Without any hesitation, he spent the majority of his practice time helping his partner to understand the material at hand. When I thanked him for his help, he replied that it was his pleasure, and, that he already had memorized the presented material. I will never forget this unselfish gentleman's help. Later, he allowed me to handle some of his own personal weapons of rare beauty and balance. When I asked where they came from, he stated that he had made them. I hope these become commercially available. After the instruction ended, a lavish banquet was served in the Sheraton's beautiful ballroom. Following dinner, awards were given to those who instructed or were otherwise noteworthy. Heartfelt thanks and feelings were shared at the microphone. More than a few tears were shed in the audience as speakers testified to the life-enhancing qualities gained by their participation in the martial arts and their faith in God. All too soon, the event ended. I feel blessed and humbled to be a part of this dynamic organization, and I know my brothers feel the same way. 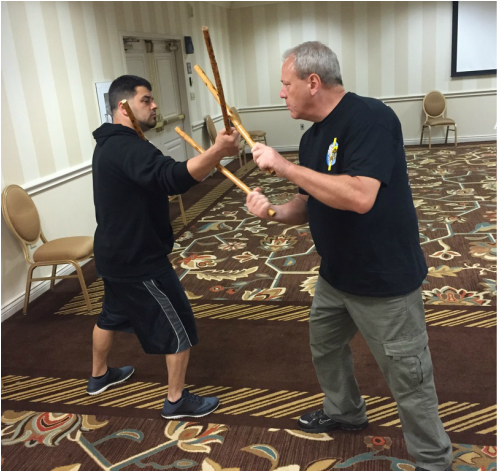 Copyright ©2015 by Chris M. Suboreau, George M. Yore & The Visayan Eskrima Guild, All Rights Reserved.